If you're looking for a delicious seafood risotto recipe, you've come to the right place. Adding seafood to risotto is a good way to spruce up this creamy rice dish. Try this recipe for seafood risotto, or make your own variations. Risotto is a traditional Italian rice dish that uses a medium grained, starchy, round white rice that isn't sticky. You can buy rice that is labeled as "risotto rice" or use Aborio rice; either will make a very nice risotto. The starch in the rice gives risotto its characteristic creamy texture. Don't use brown or sticky rice like sushi or jasmine rice, which won't work well for risotto. The seafood risotto recipe below is a basic recipe, which will work well with variations. Use different types of stock, or try different herbs or types of seafood to make the recipe your own. How much seasoning you will need depends on the type of stock that you use, as well as the type of cheese. Hard Italian cheeses like parmesan are saltier than soft cheeses like mascarpone, so taste for seasoning before you serve and adjust accordingly. Err on the side of adding too little seasoning in the beginning and adjust it at the end in order to avoid overseasoning a dish. Use the following directions to make seafood risotto, or vary the ingredients to make the recipe your own. Before starting, heat the fish stock or clam juice to simmering and hold on low heat. Heat the oil in a large saucepan until it shimmers. Add the onions and sauté over medium heat for about 5 minutes, until the onion is translucent. Add the rice to the oil and onions and sauté for 1 minute to coat the rice with oil. Add the lemon zest to the white wine, and pour both into the rice, stirring constantly as the rice absorbs the liquid. Ladle about 1 cup of hot stock into the rice mixture, stirring constantly. Once the liquid is absorbed, add another ladleful and repeat, stirring constantly until the rice is al dente. This step takes about 20 minutes in total. Melt the butter in a medium sauté pan until it bubbles. Add in the shrimp and crab and sauté until heated through. Stir the seafood mixture into the risotto, along with the parsley and cheese. Stir until cheese melts and risotto is well combined. Add a few tablespoons of heavy cream and stir into the risotto. Taste the risotto and adjust seasoning, adding salt and fresh ground black pepper as needed. Use a few threads of saffron instead of lemon zest. Replace some of the white wine with lemon juice for a lemon seafood risotto. Add fresh peas or asparagus, which will complement the seafood well. Replace the parsley with fresh herbs like basil or tarragon that pair well with seafood. Replace parmesan cheese with mascarpone, mizithra or asiago cheese. Experiment with different types of seafood. For instance, you can add wine steamed clams or mussels, mix in some bay scallops or top with sea scallops. 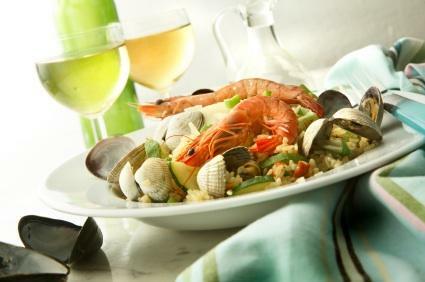 Seafood risotto is a flavorful dish; serve it topped with some shaved parmesan and pair it with a crisp, white wine like a dry German Riesling, a nice oaky Chardonnay or a sparkling glass of Champagne and a salad of fresh greens to make a complete meal.